Children play outdoors at school. Experts say schools and parents should allow enoough space for children to play in and out doors. KAMPALA. Several Early Childhood Development (ECD) or day care centres across the country lack appropriate age materials for playing and most materials are way beyond children’s understanding. Dr Anthony Mugagga, the deputy principal college of Education and External Studies [Cees] at Makerere University has said appropriate age materials play a critical role in determining the child’s chances for survival, growth and development. “Ensure that, play materials including toys and books are age-appropriate, safe for example, no small parts that a young child could swallow or choke on, and gender-responsive for example illustrations that show girls and boys in non-traditional roles,” Dr Mugaga told PML Daily in an interview. 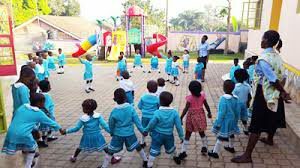 The technical adviser on gender at the Ministry of Gender, Labour and Social development Mr Jimmy Obbo, says children in nursery schools should not be taken through play materials meant for children above their age and taught to cram and reproduce work. “Anybody starts a school anywhere, puts in play materials for children without specifying the age and all children irrespective of age, class use these as play materials. This injures the children and they develop fear for the materials,” says Mr Obbo. “And most of these materials don’t stimulate the children, they instead injure them and once children start fearing them, the body produces a hormone that suppresses the brain development,” he adds. He said although activities like beading are important for pre-scholars because they learn sorting and grouping, counting and self-correction, such simple toys are lacking in most ECD schools to lay a solid foundation for the learners. He explained that wood is a preferred material, especially at an early age because of its safety and durability and stacking toys such as wooden blocks are highly rated for their multiple benefits because they improve mathematical and logical skills in children. Wood is preferred material to have around children because it is safe. Ms Sarah Bugoosi, the Sironko District Education officer says although it is clear that children must play in order to develop their brains, most ECDs including primary schools do not have playing fields for children’s development. “Having play materials in ECDs meant for mature children is illegal and I know that most ECD centres are operating outside the law, I think the ministry of Education should take action on this,” Ms Bugoosi says. She urged schools to provide opportunities for play indoors and outdoors by creating child-friendly spaces in the home, classroom, compound and neighbourhood, where a parent or adult can supervise children at all times. “And play areas should be open, comfortable and clean and include space for storing toys and books. If possible, put pictures or posters on the walls for visual stimulation,” adds Ms Bugoosi. Ms Lydia Tebekkanya, a project facilitator at Plan International said researchers tout the critical window-period as from age zero to five, during which a child is a proverbial sponge or blank slate and that during these years, a child has a virtually unlimited potential, depending on environment and exposure. She added that as parents, “we can capitalise on this amazing potential depending on what we expose our children to because from infancy, children learn primarily through human interaction and play,” Ms Tebekkanya says. “If you hold your baby, make frequent eye contact, show affection and converse with her; you are increasing her chances of being healthier and smarter,” she explains. Maintaining eye contact with the child is vital in communicating with them. She said success stories usually include children whose parents spend some minutes each day in some activity with them and urged parents to have time for their children not to relegate them to teachers. The Education Act 2008, recognises pre-primary education as the first level of education in Uganda and the Early Childhood Development sector policy recognises four programmes; day care centres, home based centres, community centres and nursery school. However, majority of these centres (about 80 per cent) are in the hands of private sector and out of the financial reach of Ugandans.